day is done, and all the numbers are in place, you can forget it. hands at the end of the day, drive home and say,"Hmm. and ,"oh I know! I can do this -- yes! That works!" Occasionally you might even hear an expletive deleted. I'm glad I'm an artist, and delighted to know you. Labels: flower painting. red tulips. acrylic on canvas. Barbara Muir. Toronto. Canada. Such a beautiful spring painting! I'm working on tulip paintings too. 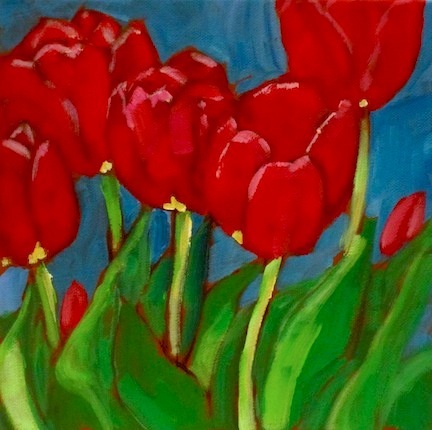 Although I don't have the wide range of tulips that you have on offer in Toronto, I found some red ones too and they are exciting to paint. Lovely, Barbara, and so true! I'm glad that you understand this obsession we all have. It's a good thing....mostly! Thanks so much -- I do love tulips. Your tulips paintings are glorious. I'm sure there are greenhouses there. I don't really look for variety. I go to the shelf with the pots and look for red ones -- sometimes Parrots -- my favorites. oh -- the cameraperson is trying to create Melinda's mountains.